The stylish Canova Hall nestled in Southwest London’s trendy Brixton is a favourite bar of mine, amongst many scattered in the district. Consistently buzzy during the weekend, the bar is decked out with fashionable furnishings; think hanging lights, retro stools and shabby-chic wall paint. I would recommend visiting for weekend brunch, where you can fill up from a diverse menu including smashed avocado on toast, chilli hash browns or even a ‘white’ pizza. 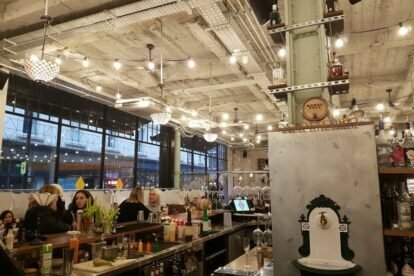 If you’re making a boozy morning out of it, there is also the ‘bottomless brunch’ option, which allows you to consume as many mimosas, rum punches, glasses of Frizzante or fruit juice for two hours for an extra £25. A typically ‘millennial’ spot, expect a crowd of young twenty-somethings meeting friends, celebrating birthdays and ‘hot-desking’ tables with their laptops. It’s not all about the coffee and daytime dining, however. Pop by during dark for late night tunes and dancing.